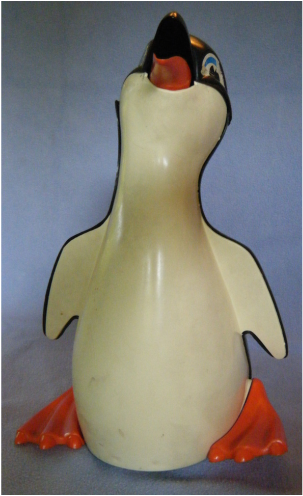 Tricky Peter Penguin is another of Remco's sound actuated toys from the late 1960s and early 1970s. Others in the series include Tricky Doodle Duck, Tricky Tommy Turtle, Tricky Busy School Bus, and Bunny Baby. All of these toys could be set in motion by blowing on a toy whistle that came with the toy and matched the character they came with. 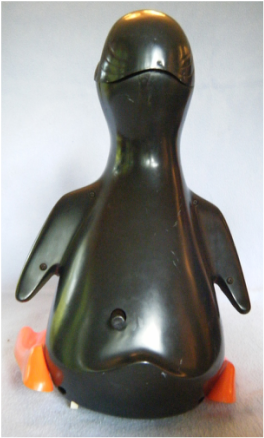 Other sound sources, of the appropriate frequency, could also activate the toys as well as gently tapping them when they were at rest. Peter was acquired through eBay. He came with his whistle but without a box. He was fairly dirty but started running as soon as we installed the two D batteries. His bill opens and closes as he squawks. He waddles by tipping from side to side. 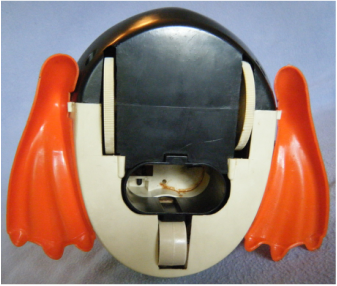 In fact, he suffered from an unusual problem for an old toy; he wouldn't stop running. 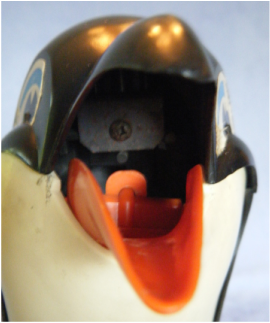 This will require adjusting a battery contact to engage/disengage from the battery when the black rod in the back of the penguin is rotated. His only other problems are a crack under one wing and damaged eye decals. We won't attempt to fix the crack, but generating replacement eye decals using computer drawing software and a color printer is in the works. 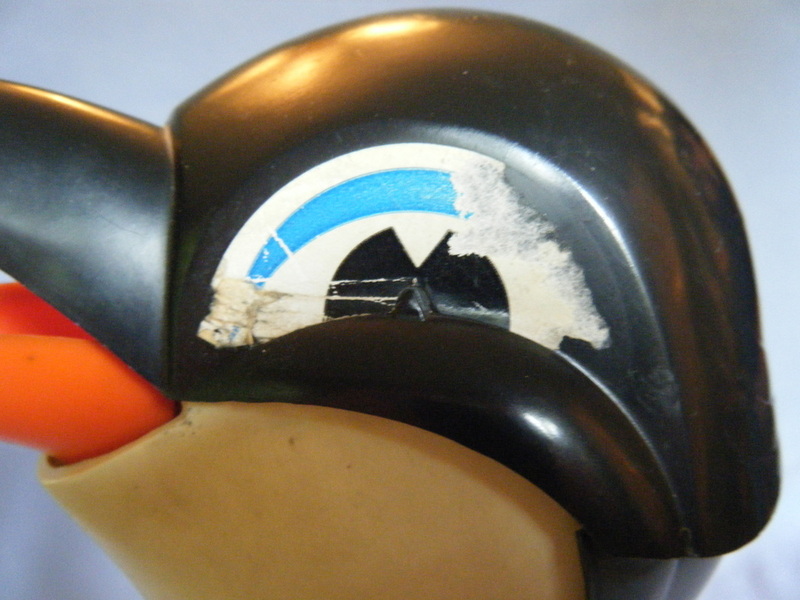 A faded, worn, and partially missing eye decal. Front view. Note that Peter has a canted head. The inside of Peter's mouth. His lower bill opens and closes in synchrony with his squawking. Rear view. Notice the black rod in the lower back that is responsible for turning Peter on and off. The head is a separate piece. The left eye decal is missing portions as well. It is hard to see in the photo, but there is a small black triangle molded into the head that helped locate the eye decal in the correct position during assembly. Peter came with his battery cover (not shown in this photo). These covers were easily lost because they don't stay in place without batteries. The battery cover uses a sliding latch. 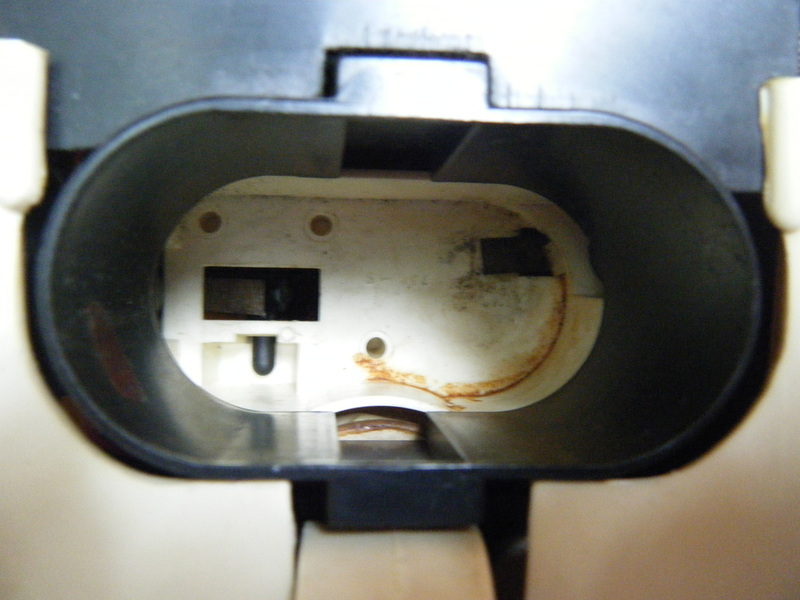 The battery compartment shows evidence of corrosion. 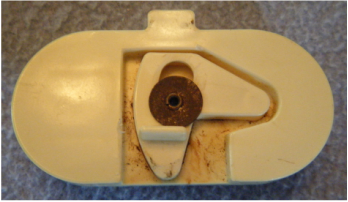 Leaving the batteries in place, while destructive to contacts, probably kept the battery compartment cover with the toy. 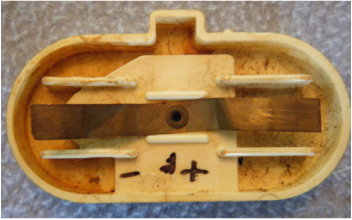 The flip side of the battery compartment cover. Notice the corrosion. Any manufacturer stickers showing battery orientation have long since vanished. The previous owner used permanent marker to show battery orientation. It wasn't helpful because the cover fits in either direction. 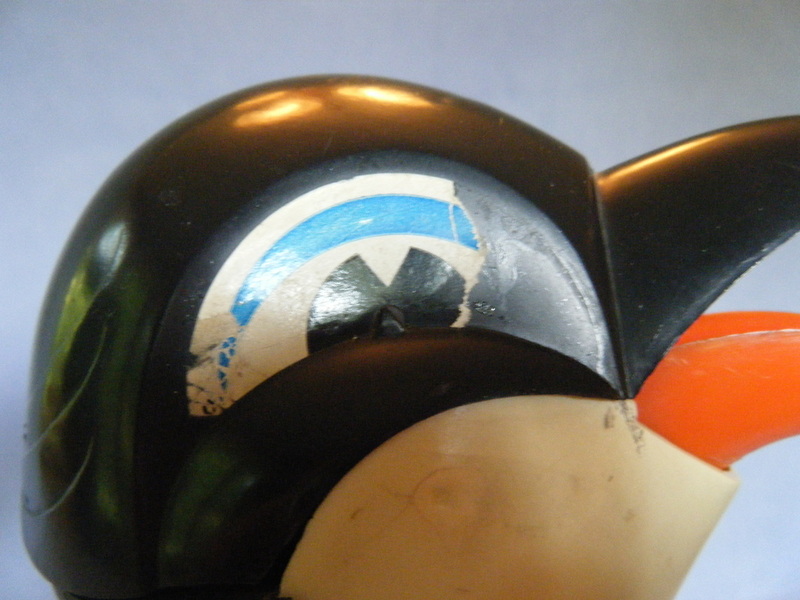 You have to look at the placement of the contacts inside the penguin to figure out the correct battery placement. Peter's whistle is a cool toy in it's own right. Oddly, the whistle depicts a bow tie, but Peter doesn't have a tie. 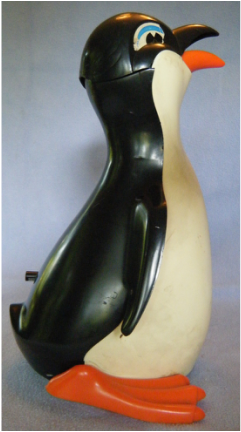 Side view of the whistle showing it's two tone construction. Back view of the whistle.